Rustic elements complement The Carden, from the cedar shakes and metal accent roof to the decorative gable brackets. 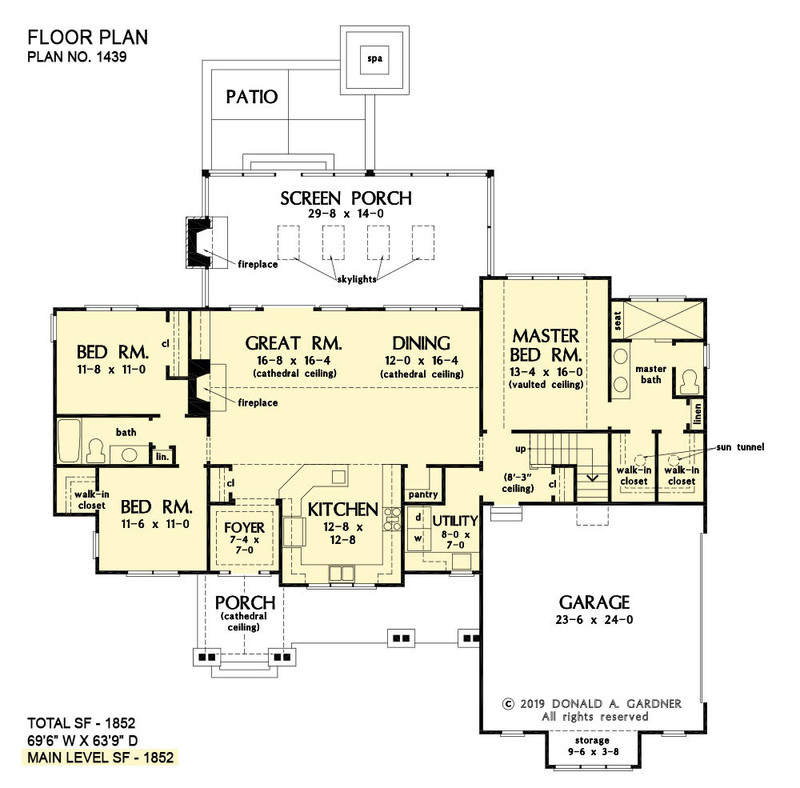 The floor plan is completely open with the great room and dining room blending under a cathedral ceiling. Outdoor living is lavish with a massive screened porch equipped with a fireplace and an array of skylights. A true retreat, the master suite offers an oversized walk-in shower and two walk-in closets with sun tunnels to bring in natural light. 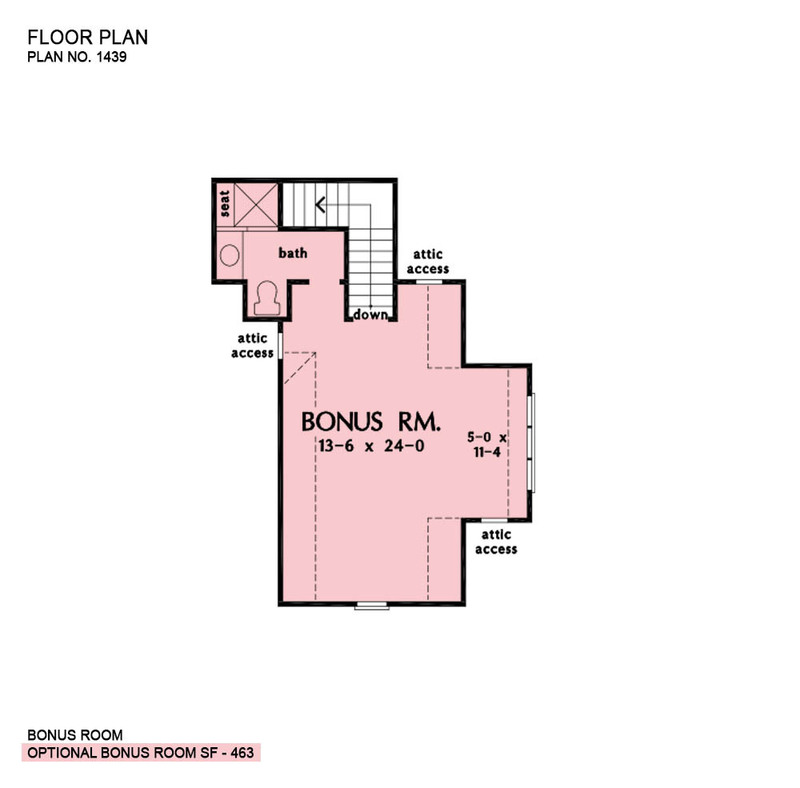 Two bedrooms and a bathroom are to the opposite side of the floor plan and an optional bonus room and bathroom are upstairs for a guest suite or future expansion. 1st Floor: 1853 Sq. Ft.
Porch - Front: 224 Sq. Ft.
Porch - Screened: 457 Sq. Ft.
House Dimensions: 69' 6" x 63' 8"
Great Room: 16' 8" x 16' 4"
Foyer (Tray): 7' 4" x 7' 0" x 9' 9"
Dining Room (Cathedral): 12' 0" x 16' 4" x 17' 10"
Great Room (Cathedral): 16' 8" x 16' 4" x 17' 10"
Kitchen (Flat): 12' 8" x 12' 8" x 9' 0"
Utility Room (Flat): 8' 0" x 7' 0" x 9' 0"
Bonus Room (Clipped): 13' 6" x 24' 0" x 8' 0"
Garage (Flat): 23' 6" x 24' 0" x 0' 0"
Garage Storage Bay (Flat): 9' 6" x 3' 8" x 0' 0"
Master Bedroom (Vaulted): 13' 4" x 16' 0" x 12' 0"
Bedroom #2 (Flat): 11' 6" x 11' 0" x 9' 0"
Bedroom #3 (Flat): 11' 8" x 11' 0" x 9' 0"
Porch - Front (Cathedral): 10' 0" x 9' 4" x 15' 2"
Deck / Patio (None): 18' 4" x 11' 8" x 0' 0"
Porch - Screen (Flat): 29' 8" x 14' 0" x 9' 0"